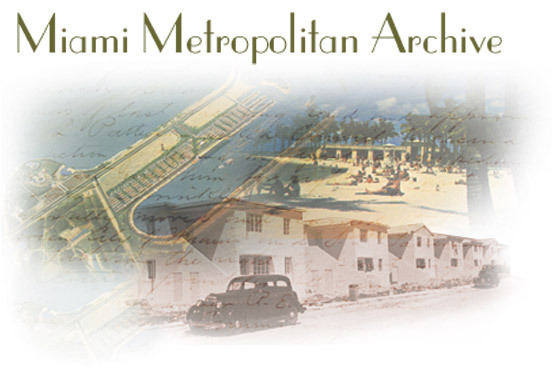 The Miami Metropolitan Archive is a digital library of important source materials relating to Miami-Dade County history, management, development, and culture. Originally developed as a cooperative effort of the Green Library at Florida International University Libraries, the City of Miami City Clerk's Office, and the Florida Center for Library Automation, the project now involves resources from diverse local agencies, organizations, and individuals including the Coral Gables Historical Resources Department, City of Miami Planning Department, FIU Professor Marvin Dunn, and more. Among the topics addressed in the collections of the Miami Metropolitan Archive are local history, community development, urban planning and design, resource and environmental management, area studies, architecture, transportation, education, Black Miami, multicultural issues, and more. The Miami Metropolitan Archive is continually growing and evolving to meet the needs of researchers, decision makers, educators, students, and the interested citizenry. To suggest additional materials for inclusion in the Archive, please contact the Green Library's Digital Collections Center (e-mail: dcc@fiu.edu).